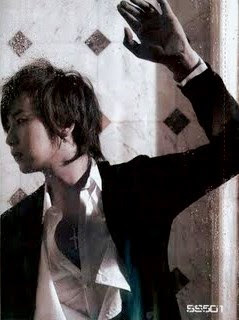 Oh, MiniUFO posted these yesterday in her blog SS501UFO...I couldn't resist [my resistance only lasted one night] and just had to steal have it for my blog...can't wait till she finishes all ^^ Thanks, miniUFO ! As member Jung Min think that Young Saeng's face is similar to an otter, especially when he smile, so he started to call him 'Otter', and slowly everybody else also follow suit. 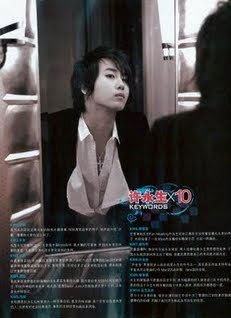 Also one of the nickname of Young Saeng, mostly called by China fans. It is the cute form of Otter, in addtion to Young Saeng's young & fresh looked, everybody think that this is a suitable title for him. When in Hong Kong, Young Saeng was pushed out by the other members to perform Girl's Generation's cute dance 'Gee'. His shy expression is similar to a pure young girl, very adorable. He had also disguised in lady look on screen many times, his beauty even made Hyun Joong wanted to take him as wife. Seemingly shy Young Saeng actually has very good relationship with people. As he was once a trainee from SM, therefore he has very close relationship with DBSK's JeaJoong, YunHo, and also Super Junior's Siwon. He had even stayed together with JeaJoong before. Nice looking Young Saeng is also similar to many who love to take self portrait. It has even become an addiction to him. He is very good in choosing the correct angle. Of course sometimes he will pull in the other members, the kind Kyu Jong was always asked to take photo together. In the Hong Kong fan meeting, Young Saeng mentioned that he like the look when a girl bite the hair band and tie her long hair. On the spot, he borrowed a fan's hair band and bit it in his mouth to demonstrate it, causing a commotion. Hyun Joong once exposed, there was once when he went to Young Saeng's home, when two of them was having fun, suddenly Young Saeng become sentimental and start to light up candle in his room and almost caused his room to burn down.
' 许金金' was always mistaken as another nickname of Young Saeng. Actually it is a combination title which fans created to represent the team during the time when Heo Young Saeng, Kim Kyu Jong & Kim Hyung Joon promoting their 'U R Man' album. The way Young Saeng being sneak attack was different from Hyun Joong, because the sneak attack was by his own team members. The reason is because Young Saeng has a otter lookalike face that is very lovable, so the rest of the members like to pinch his face. As he cares a lot of his image, he had once run away from the camera and used a hat to cover his messy hair when just woke up. This is just to retain of his screen image.